 USA  2007  84m   Directed by: Frederik Du Chau.  Starring: Jason Lee, Peter Dinklage, Jim Belushi, Patrick Warburton, Alex Neuberger, Taylor Momsen, John Slattery, Amy Adams, Brad Garrett, Samantha Bee, Timothy Crowe, Larry Vigus, Mario Mariani.  Music by: Randy Edelman. 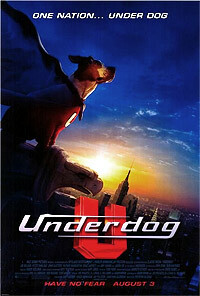 Story of the creation of Underdog and adventures battling Simon Bar Sinister in a live action format. First we have Showshine picked up off the street and brought to a science experiment lab where Simon Bar Sinister works. He fights back when Sinister tries to inject him with a chemical and accident occurs, he gets superpowers and the lab blows up wounding Sinister. On the street Shoeshine runs afoul of Riff Raff, another dog and gets picked up by Jim Belushi who was a guard at the lab. Belushi's son discovers that Shoeshine has all these powers and eventually Shoeshine becomes Underdog, who will once again battle Sinister. Once you decided that under dog was going to be a real dog you've sort of limited yourself as to whether the film was going to work or not. For me the film half works and half doesn't. The part that doesn't is all of the stuff where you see Shoeshine, the dog, as a dog with his master. Some of the repartee is funny, but it just drags on and on as we get introduced to Sweet Polly and her mistress and we go through all the typical lets see what you can do stuff. Its a deadly 20 or 25 minutes and effectively kills the film. Its painfully dull and feels like it takes forever to get through it, which considering the film is say 75 minutes sans credits, is something you don't want to do. The parts that are good are anything with Simon Bar Sinister (Peter Dinklage is a blast) and anything where Underdog goes into action. Some how somewhere they managed to find a way to be both twistedly true to the spirit of the cartoon and to update it. Of course I could be wrong since the middle section is so dull, but I think not, since I do look forward to catching the end of this again on cable. As a whole its probably as awful as some people have said, but if you can wait for cable where you can stumble on the good parts, this is an okay cartoon to film adaption.